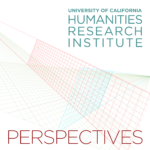 Interview with Karen Bassi, Literature and Classics, UC Santa Cruz, Convener with UCHRI Director, David Theo Goldberg about the Fall 2015 Residential Research Group. The fact and consequences of human mortality are principal variables in humanities research. And yet this fact, so often relegated to euphemism, has resisted anything like a comprehensive and sustained interdisciplinary approach. Although the prospects of fearing, facing, and evading death can be found in scholarship in a wide number of disciplines, the study of mortality per se is not a recognized area of research in the humanities. The aim of the Residency is to identify the theoretical and methodological approaches that can initiate and sustain the study of human mortality as a recognized field within the humanities, as a platform for rigorous collaborative research, and as a basis for undergraduate and graduate curricula. The Residency will bring together scholars from a variety of fields in the UC system to discuss and debate the interdisciplinary history of mortality as a basis for comparative study, across cultures, disciplines, and historical periods.